Beauty has a well-documented impact on labor market outcomes with both legal and policy implications. This monograph investigated whether this stratification is rooted in earlier developmental experiences. Specifically, we explored how high schools' dual roles as contexts of social relations and academic progress contributed to the long-term socioeconomic advantages of being physically attractive. 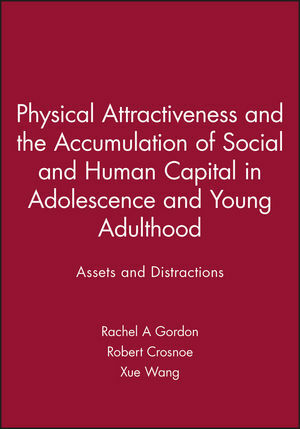 Integrating theories from multiple disciplines, the conceptual model of this study contends that physically attractive youths' greater social integration and lesser social stigma help them accumulate psychosocial resources that support their academic achievement while also selecting them into social activities that distract from good grades. A mixed-methods design, combining statistical analyses of the National Longitudinal Survey of Adolescent Health and qualitative analyses of a single high school, supported and expanded this model. The data revealed that the benefits of attractiveness flowed through greater social integration but were partially offset by social distractions, especially romantic/sexual partnerships and alcohol-related problems. Interview and ethnographic data further revealed that adolescents themselves understood how physical attractiveness could lead to favorable treatment by teachers and classmates while also enticing youth to emphasize socializing and dating, even when the latter took time from other activities (like studying) and marginalized some classmates. These patterns, in turn, predicted education, work, family, and mental health trajectories in young adulthood. The results of this interdisciplinary, theoretically grounded, mixed methods study suggest that adolescence may be a critical period in stratification by physical appearance and that the underlying developmental phenomena during this period are complex and often internally contradictory. The monograph concludes with discussion of theoretical and policy implications and recommendations for future developmental research. Rachel A. Gordon is an Associate Professor in the Department of Sociology and the Institute of Government and Public Affairs at the University of Illinois at Chicago. Gordon's research examines contextual and social factors that affect children and families. She has studied how childcare quality affects child development, the relationships between youth gang participation and delinquency, the association between community context and child wellbeing, the causes and consequences of grandmother co-residential support for young mothers, and an evaluation of an innovative job program for young couples. She is the author of two textbooks (Regression Analysis for the Social Sciences; Applied Statistics for the Social and Health Sciences) and has published her research in leading academic journals including the American Journal of Evaluation, Child Development, Criminology, Demography, Developmental Psychology, Journal of Marriage and Family, and Journal of Research on Adolescence. Robert Crosnoe is the Elsie and Stanley E. (Skinny) Adams, Sr. Centennial Professor in Liberal Arts at the University of Texas at Austin, where he is a faculty member in the Department of Sociology, Department of Psychology (by courtesy), and Population Research Center. His main field of interest is the life course and human development, with a special emphasis on social psychological approaches to education and how they can illuminate socioeconomic and immigration-related inequalities. His current work focuses on the role of general developmental processes, including health and social relationships, in the educational experiences of Mexican-origin children and of children and adolescents from socioeconomically disadvantaged families. His books include Mexican Roots, American Schools: Helping Mexican Immigrant Children Succeed (Stanford) and Fitting In, Standing Out: Navigating the Social Challenges of High School to Get an Education (Cambridge). Xue Wang is a PhD Candidate in the Department of Sociology. Her research interests include the development of children and adolescents across different social settings. She has a couple of journal publications examining childcare quality and mother's related outcomes. She is also involved in the research about surgery qualities with some publications. Xue's dissertation examines the parental influences on adolescents friendship formation.